Why Georgia and Romania should be best friends? ASTRA documentary film festival has been taking place annual ly for 22 years in Sibiu, and I attended it for the second time this year. I will directly start with a big spoiler for my article and you will know what to expect from the very beginning: I loved ASTRA both times! This movie festival is simply breathtaking! What makes it so exciting? Well, many things… First of all, the atmosphere of the town itself offers everything to a person who knows how to appreciate a true, sincere town with some character. Currently living in Bucharest in the area of Dristor, full of grey communist buildings, in Sibiu I felt like Alice in Wonderland, being surrounded by small, elegant houses. I couldn’t help looking around and enjoying its narrow, colorful streets. Yet, you can still feel the traces of communist era if you pay close attention. 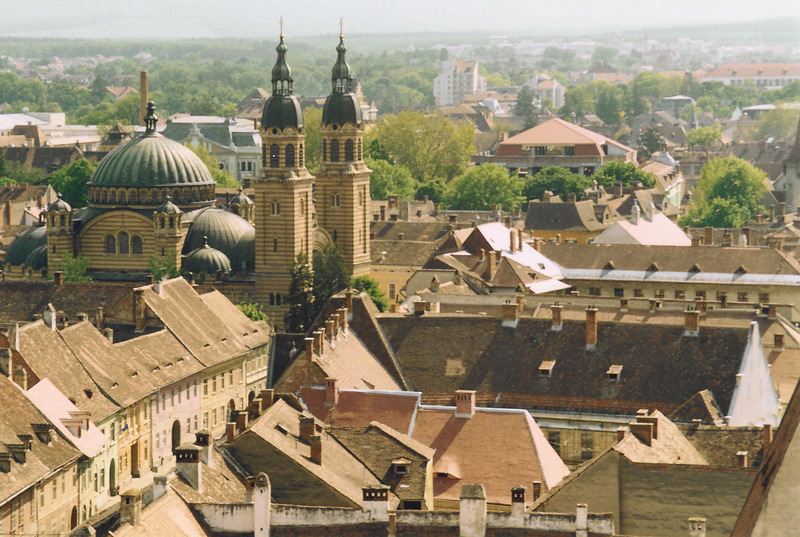 This double sensation of not being sure what century, culture and system surround you turns Sibiu into a town that is not “easy-to-read”. It provokes thoughtful mood and turns you into an artist even if you are a just a regular Economist like myself and strictly professionally speaking, you don’t have anything to do with cinematography. Immediately after getting there, I was ready to sit down in a local bar with a warm drink, to put a smart, artistic expression on my face and become as philosophical as it gets. After all, being a passionate viewer is also some sort of art, isn’t it? Well, ASTRA film festival material surely offers opportunity to be even more thoughtful and to actually enjoy the work of people who don’t just put smart expression on their faces, but actually are smart artists. I would like to mention that I don’t pretend to evaluate the festival in any way; I will just write my personal impressions about 5 movies that I especially enjoyed. And I will also honestly admit that out of the 5 movies mentioned below, I liked the first 2 more than the other 3. Oh and one more important thing: Although I will try not to include spoilers, read at your own risk since everyone has different degree of what might count as a spoiler. The movie focuses on a story of a person, who is the son of an Arab man and Jewish woman. Actions of his parents over their lives affect his life dramatically. His father is behind mysterious terror attacks that took place in the 1960s and, of course, after discovering this, the family falls apart and the events take chaotic course. Viewers are given the opportunity to look at the dramatic situation from the perspective of the son, who ever since he was a little boy, was forced to deal with the consequences of his parents’ actions and how he always had to redefine his ethnicity and identity based on where he lived. He tells his story with a certain self-irony and you can tell that he fully realizes the absurdity of events that took place in his life. Over the whole movie, I was sitting on my chair fixed as if I was spellbound and I couldn’t take my eyes off the screen. The honesty of the storyteller lets you get to the core of the problem of today’s mankind and how rivalries based on religion and ethnicity can create even larger and larger gaps in intercultural tolerance. It made me realize once again that racism is still a huge problem. It affects people’s lives constantly, continuously and in a dramatic way. You cannot watch this documentary without feeling yourself in the storyteller’s shoes, without opening your mind a little bit more to the whole world and to condemn all the meaningless wars that are still fully raging. The movie does not include any fancy mechanisms of telling the story, no re-enactments or historical information. Simply, people honestly share what they had to go through personally as the conflict rises. I believe this approach makes the movie what it is and gives to it the great power that impresses the viewer and makes you understand the whole conflict better than it would be possible if the movie simply provided the facts and numbers about the tragic events that took place in the region. I will probably be a bit subjective while reviewing this documentary since the director of the movie is one of my favorite Georgian directors and actions take place in Tbilisi, Georgia. Nino Kirtadze’s camera follows a Georgian man, Levan, in his forties through his medical examinations in order to treat his aching shoulder. Nino Kirtadze used a mixture of fiction and reality and “played” a bit with the characters’ lives in order to push them to the certain intersections of events and episodes. If you have ever been to Georgia, you will understand the whole flavor of the movie much better since it perfectly shows the characteristics of Georgian society. In a very subtle way, sadness and laughter become an interesting mix and you cannot take a smile off your face observing how a 40 year old man becomes like a child in certain situations and yet, tries/struggles to stay calm and manly as it is every Georgian man’s “duty” to do so. The movie reveals human strength and weaknesses that all of us have to deal with from time to time. Apart from Georgian society, the movie can give you some insight into Georgian health care system as it includes unintentionally satirical episodes from several doctors’ cabinets. Shortly, if you are interested in a society that is going through a huge transformation and you enjoy dark comedy, this movie is exactly for you. We had an opportunity to meet Nino Kirtadze personally after the screening and ask her questions about the working process. After talking to her, you realize the main reason why her documentaries are so great. Simply because she is an honest artist who puts her whole heart in what she does. Her excitement about the movie was contagious for the viewers and I was ready to discuss the issues mentioned in the movie with no end. Except “Don’t Breathe”, she has other extremely interesting documentaries that concern subjects as: bizarre traditions of funerals in Georgia (“Dites à mes amis que je suis mort”, 2004), dictatorship precedent in a Russian village (“Durakovo: Village of Fools”, 2008) and few other documentaries that are all related to Georgia and give you great insight on several issues. When we were discussing her shocking movie “Durakovo: Village of Fools”, I asked her somewhat controversial question how we, Georgians should try to find common language with ordinary people from Russia since our countries have very complicated relationship. She answered smiling that arts is the only way to find common language and if I manage to talk to a Russian person after watching her movie and there will be no aggression between us, that would already be a great achievement. I couldn’t agree with her more. The movie focuses on the last days of communism era in Romania, when people found escape from the “locked system” through Hollywood movies. It describes the excitement of youth and not only youth who would gather around VHS to watch videos that were illegally circulating among people. It perfectly demonstrates the power of simple curiosity. The movie offers perspectives from different layers of the society since no one was able to resist the “muscles of Chuck Norris” since you probably know, Chuck is omnipotent. When Chuck Norris meets communism, he won’t become communist, but communism will become “Norrist”. The only thing that disturbed me a bit while watching this movie was too much “make up” as it had lots of re-enactments and added commercial flavor to the movie that was a bit exaggerated for my personal taste, but it didn’t stop me from enjoying the story, from laughing and feeling related to the similar situations from Georgia. The movie tells a story of a Romanian family who has been building a house for 30 years. It became a dream that made them prisoners of an unfinished project. The movie makes you think about long-term plans and commitments that people make to each other, to their children or sometimes to a building that in the end is just a collection of bricks, but might become something that owns you. The obsession of a wonderful house influences family’s everyday lives even if they try not to be too influenced by the construction. It simply becomes their way of living and you ask yourself: do people own houses or do houses own people at times? Well, for sure this movie is about another building that owns people and not just a family but up to three thousand people. It represents a huge block of flats that was constructed in the communist era in Poland with 15 floors and 762 flats. The movie catches the rhythm of the building in a very interesting way allowing us to observe the movements in the narrow, grey hallways and in incredibly small flats. After all, each small flat has its own inhabitants with their different lifestyles and backgrounds. Again, another attempt of communism to make people unbearably similar and equal that gave the exact opposite result, underlining the differences of people even more. As I already said, I enjoyed the whole festival a lot and at the end I had a feeling that I had a journey back in time, in different cultures, could look into people’s deepest worries and hopes and could understand a lot more about myself and my own culture. Where else do you have this kind of opportunity? Well, if you know more opportunities like this, let me know please, wouldn’t like to miss them. Special thanks to my great friend, Oto Peikrishvili for a cool idea for the title. ბუქარესტო, გახდი რა ჩემი ქალაქი!